These Silver Certificate One Dollar Bills were made until the United States government stopped silver coins for circulation. Has a blue serial number and seal, says "Silver Certificate" above George Washington's portrait, Each on is housed in a soft clear plastic sleeve (removable paper money) holder for easy storage. Each genuine dollar note is in Good or better circulated condition. Dates will be 1957 or earlier. These two dollar United States bills are no longer being made. They get their nick name "red seal notes" from the distinctive red serial number and seal on the front. For years thought of as easy to find currency, but where are they now? Comes to you in a soft clear plastic sleeve (removable paper money holder) for easy handling. Each genuine two dollar note has seen a bit of circulation and is in Good or better condition. Dates will be 1963 or earlier. Like the two dollar bills above, these $5 red seal notes are no longer being made. They get their nick name "red seal notes" from the distinctive red serial number and seal on the front. They also say "United States Note" rather than "Federal Reserve Note" on the top. Each piece of currency comes to you in a soft clear plastic sleeve (removable paper money holder) for easy handling. Each genuine five dollar note has been circulated and is still attractive looking. Genuine United States government currency. Dates will be 1963 or earlier. Sample image of Front and back of a typical note. Like the $1 silver certificates, these were made until the United States government stopped minting silver coins for circulation in 1964. 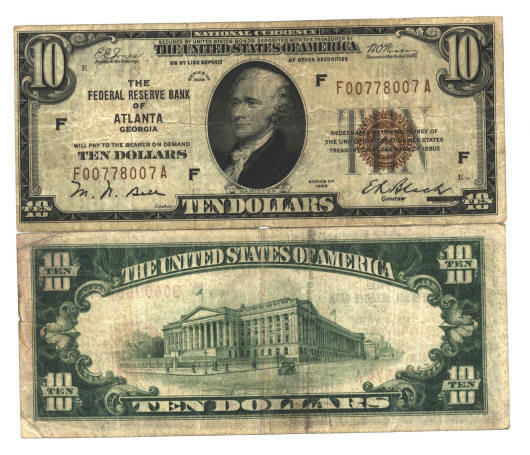 Each note shows the words "Silver Certificate" at the top above Lincolns portrait, with a blue serial number and seal. Each on is housed in a soft clear plastic sleeve (removable) holder for easy storage. You won't find these in circulation anymore. Each genuine paper money note is in Good or better circulated condition. Dates will be 1957 or earlier. These $10.00 silver certificates are harder to find than the $1 or $5 ones. They were printed until the United States government stopped minting silver coins for circulation in 1964. Many silver certificates, like these, were turned into the government years ago and replaced with Federal Reserve notes. Each note shows the words "Silver Certificate" at the top above Lincolns portrait, with a blue serial number and seal. Each on is housed in a soft clear plastic sleeve (removable) holder for easy storage. You won't find paper money like these in circulation anymore. Each genuine ten dollar note is in Good or better circulated condition. Dates will be 1957 or earlier. These $10 bills are dated 1929 and earlier. Sometimes referred to as US National Currency. Although these ten dollar notes are the same size as today's currency, you will notice many differences. The most noticeable is that this US government issued paper money has brown serial numbers. These National Currency ten dollar notes depict the issuing Federal Reserve Bank in large print on the front. Each note has some wear (grading good or better), is dated 1929 or earlier. The Federal Reserve location may vary from photo above, and it comes in a soft clear plastic sleeve (removable) holder for easy storage. Thank you for visiting us at http://lynncoins.com No inventory is kept on the premises.